There is a veritable ebb and flow of emotions when I watch this drama that no other drama is giving me at this moment. Granted I’m a big fan of Hwang Jung Eum, but Ryu Jun Yeol is just killing his role and adds that extra something that makes this drama so fun to watch. With Bo Nui’s constant rejection of Soo Ho, one would think that he would be the embodiment of misery, but what I get from him is a desperation to be with her, a love that is so strong he is willing to meet her at the roadblock in their relationship and reach out. In that moment after their kiss I completely felt for Soo Ho, there he was before the woman he loved, who not only showed her sincerity with tears, but confessed with her mouth that she liked him, but she wouldn’t enter a relationship with him. The thought alone is confounding and frustrating, but simultaneously, I find myself sympathizing with Bo Nui. She firmly believes that she is misfortune personified, and these beliefs have been an impediment to her developing a relationship with anyone. Her longing in that moment was so clear, and this is what’s frustrating, she desires something she can easily have, but she is too afraid to claim a love that seems fated to be hers. This sentiment is reiterated numerous times throughout the drama, starting with the allusion to the red string of fate during the hospital visit. His later comparison of their relationship to a math problem, there is only one answer, but some may need more time to figure things out as opposed to others. Also when he describes his waiting for Bo Nui as a picnic because he knows “the train will come” meaning she will come around. Although he may decry things such as fate to be superstition, he clearly subscribes to the concept, he just frames it as logic. Whatever it is, he has no intention of taking no for an answer and this adamancy is what keeps their relationship alive. Regardless there are those who try to mount an assault to their romance. Geun Woo, although lovable, has yet to be much of a threat to their relationship, he is nothing more than a little brother to Bo Nui. He doesn’t seem to know it yet, but he is set to serve a life sentence in the friend zone. However that doesn’t stop Amy from pivoting on her stance against Geun Woo’s relationship with Bo Nui, to a now more supportive one. It’s all too clear that when she claimed she expected him to win, that what she really wanted was to throw a wrench in Bo Nui and Soo Ho’s relationship. She actually thinks she still has a chance with Soo Ho, but I love the rude awakening he gave her. Totally oblivious to Amy’s feelings, he confesses about his feelings towards Bo Nui, and is clearly thinking about Bo Nui, even when he is with Amy. It must have hurt despite it being unintentional, but it felt like vindication after Amy flaunted her feelings, and perceived past with Soo Ho, in Bo Nui’s face. Frankly, it was icing on the cake when Soo Ho revealed Bo Nui was his first love and kiss, meaning Amy’s existence might as well have been smoke and mirrors, because no matter how special Amy thought she was to Soo Ho, she never came close compared to Bo Nui. Ultimately the one who can make or break this love line is Bo Nui and Soo Ho themselves. I think this was demonstrated well at the end of episode 11. Bo Nui meant well in trying to help Soo Ho reconcile with his father, but ultimately it resulted in his pain. On his way to meet her, he was on this undeniable high, but the truth kicked him off a mountain peak straight into the unforgiving ground. Bo Nui couldn’t see what she had done, and in that moment probably took for granted the depth of his feelings for her, but it was clear that Soo Ho felt used. What hurts most for me in this scene is that Bo Nui didn’t come for him, when he clearly waited to confirm that the words he threw at her were wrong, that there was still a chance for them even if she needed more time. Yet she never went to him, and he walked off with a broken heart. But truthfully it was not only Soo Ho heart that was broken, but Bo Nui’s as well. She seemed paralyzed in that place, wanting to go to him, but unable to do so. She clearly cares for him, trying to bridge the divide between father and son is a demonstration of her love for him, because she could see how hardening his heart was not good for him. However the execution was wrong, and those tears don’t do much towards saving her relationship with Soo Ho, it is more like a good bye. Before seeing the preview, I was mentally steeling myself for a sad episode about how the leads come to terms over their fight, but the preview has put me over the moon. As of now tomorrow can’t come soon enough. There is one thing I’m a little worried about, although this drama has steered clear of anything overly messy, these recent episodes have been hinting at Soo Ho having a possible birth secret. Today’s episode really gets one to wonder when Young Il is described to be a genius of his generation and once had the acclaim that Soo Ho currently has. Also it is hard to ignore the similarities in their demeanor and quirkiness. 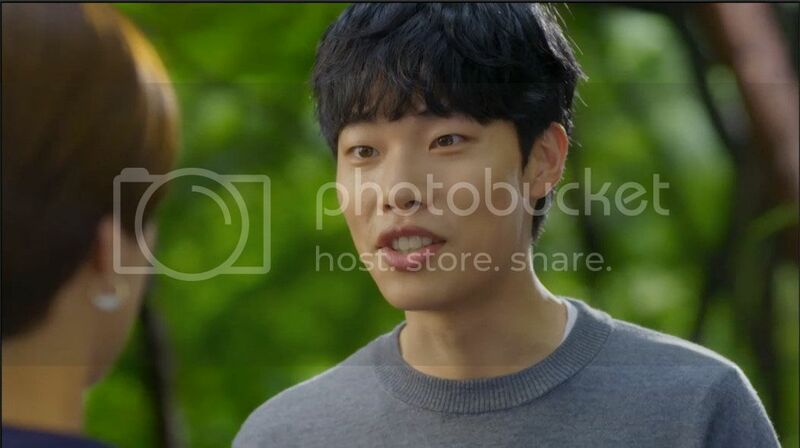 The writers have already used this tentative connection to fuel Soo Ho’s father’s drunken tirade, I am not sure I am looking forward to what they will come up with next with regards to this issue. Next articleLucky romance episode 12 review- Happiness is here! I also noticed the possible birth secret storyline. Actually it could be a blessing for his character since he has been so shunned by his father that he can potentially find support from Young Il. Anyway, episode 12 can’t come soon enough. I am truly looking forward to the OTP being together and facing challenges as a united front. I am just wondering if you guys can help me on something. Hi, admin! Do you know the title of the song used when Soo Ho was changing outfits in episode 11? I cannot understand korean that much and I really like the song. Thank you so much!